The Hua Hin Golf Festival is celebrated every year during the period of August to September. The Tourism Authority of Thailand’s offices in Phetchaburi and PrachuapKhiri Khan provinces, in co-operation with the Phetchaburi-PrachuapKhiri Khan Golf Course Association, organizes this festival for Golfers and Golf lovers every year. The Hua Hin golf festival has turned out to be very exciting and popular not only among the dwellers but golfers around the globe as well. Every year, it becomes a pool for the golfers who search Golf, vacation and luxe in affordable budget. At Just RM 2988 + get Minimum RM 200 OFF. Not just these, but there are other golf courses as well, which are ready to catch one’s attention. 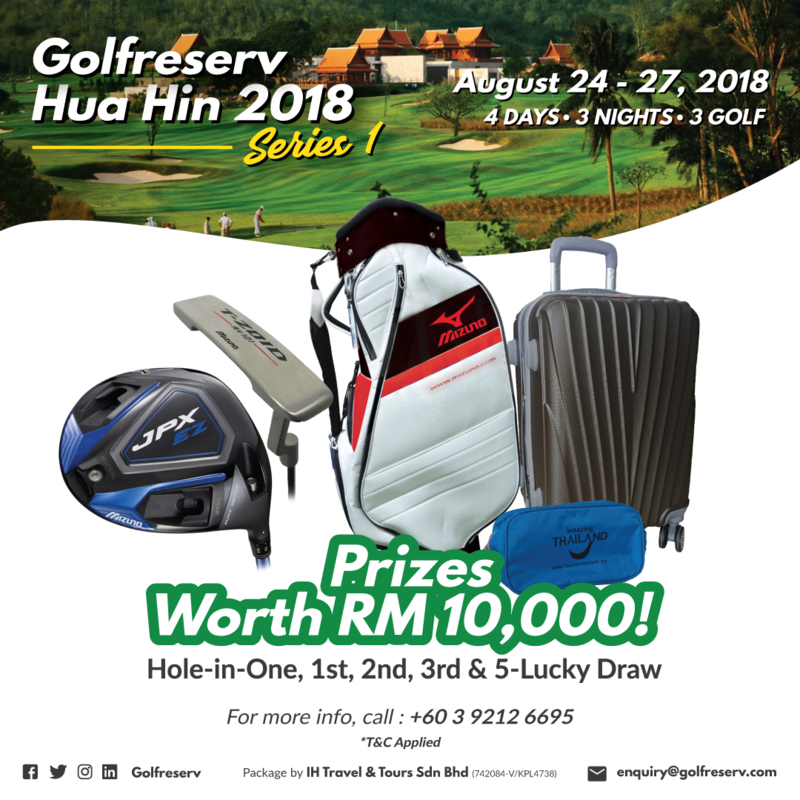 With the cooperation of Air Asia and The Tourism Authority of Thailand, Golfreserv has brought up Hua Hin Golf Package filled with exciting gifts, awards and prizes for golfers or participants. This mini-tournament includes lots of lucky draw awards as well, from the Golfreserv and Tourism Authority Of Thailand. Have you successfully done Hole in one? Well, the travel packages also include exciting gifts for such pro players. One of the biggest reasons to visit Hua Hin an extreme dip in prices of things related to golf during the period-August to September. The sky-rocketing green fees also come down under 800 Indonesian baht during this time. Perfect for budget finders and golf aficionados as well as pros and amateurs, this festival is an open solution to all. The regional tourism department also promotes golf to provide a valuable boost to assorted local businesses; otherwise, this period counts as the traditional low-season. Not just golf courses but the amenities, pro shops, restaurants and the clubhouses also bring down their price ranges. Yes, the sub-heading captures the right sentiments of the golfers. 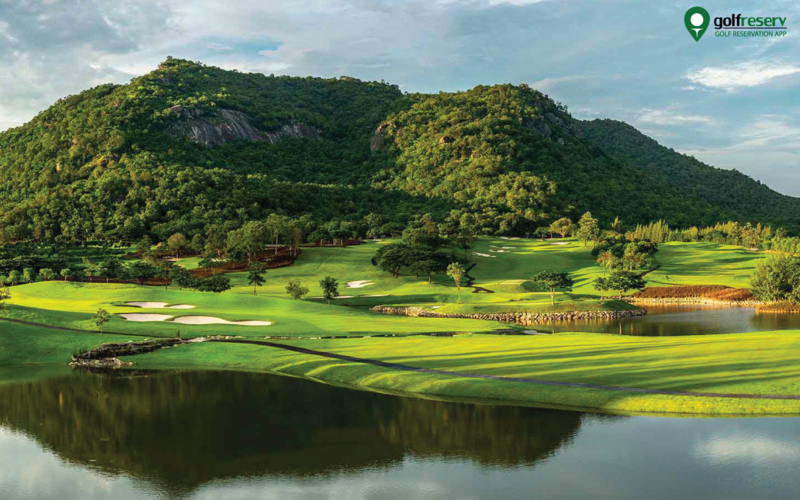 The Hua Hin Golf Festival is the right time to choose Asia’s some of the top and most popular Golf club resorts and Hotels. 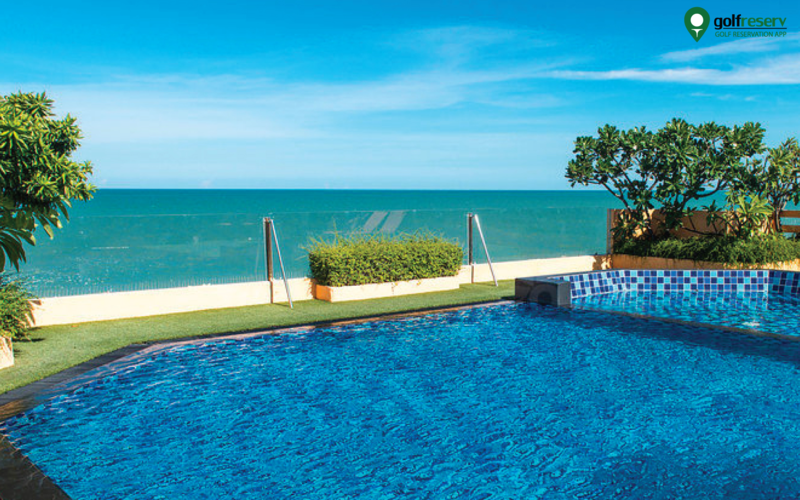 One of the most famous is FuramaXclusive Sandara Hua Hin 4-star resort in Thailand which boasts terrace pool and Venice like architecture. Just 2.5 hours drive from Bangkok, the hotel is not so far from Khao Sam Roi Yot National Park as well. You can explore other hotels and hostels from 5-star to shared, all will be giving a huge amount of discount during this period. Kite-surfing is a huge fave in Hua Hin, Thailand and during the Hua Hin Golf festivals, the spot becomes the pool for several adventurers and sportspersons. If you are visiting Hua Hin during these days, kite-surfing will bring you a life bending experience and to attempt this you can also get kite-boarding lessons. If you wish to go beyond trekking and tripping, Hua Hin’s vineyard will an exclusive reason (other than golfing) to join the Golfreserv Hua Hin 2018 Series now. Not only you can taste the finest kinds of wines here but can also enjoy the luxurious scenery from the vineyard. And after golfing tournament, if you target to hit the trails and explore the land of Hua Hin, rent a mountain bike to enjoy the ecstatic land of Thailand. And last but not the least, don’t miss the bravest job of elephant ride in Hua Hin! The place is also famous for serving exotic dishes that are hard to miss by if you are already in Hua Hin. You can always expect tarnisher here because Thailand-ians love to showcase their gratitude through food. If you picture yourself as an epicure, don’t hesitate to taste assorted Thai spices; they are mesmeric. Some of the cuisines that you just can’t miss are - Naeb Kehardt, Fried duck rice, Lod Chong, Thai Sushi, Rotee (not roti or roti canai) and Hot cruller. The list just not ends here but it’s up to you how do you like to enjoy your Hua Hin Golf Festival Trip. 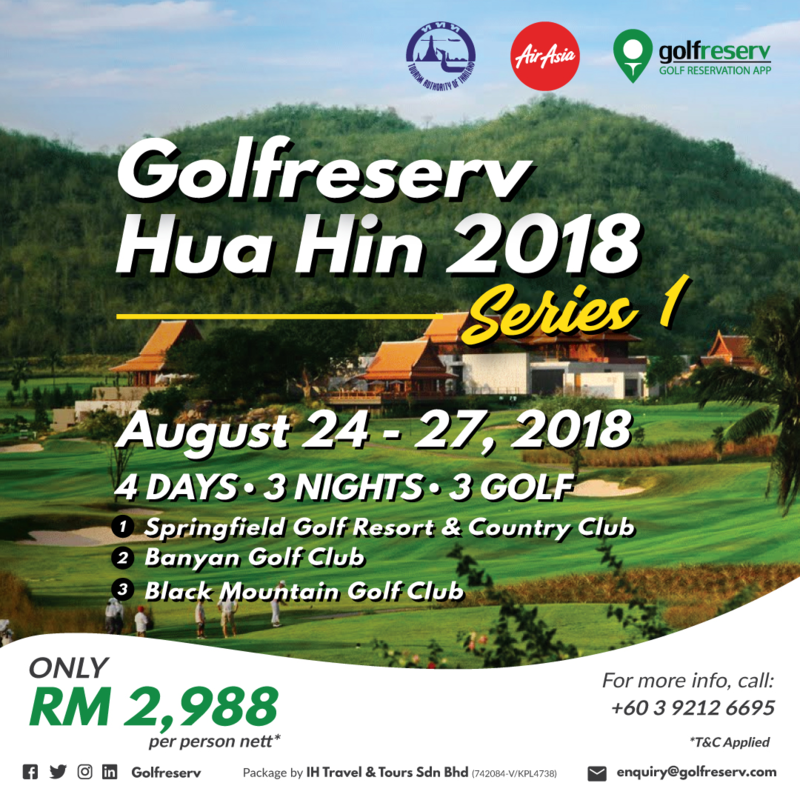 Now, your true Golfer heart will surely want to join Golfreserv Hua Hin 2018 Series!